One of my NYC favorites is a Shanghai-style deli called Mooncake. For $8 I could get Miso Salmon cooked to perfection. I never even attempted to make the dish, because I didn't think it could live up to the Mooncake version. Well, Dallas is just too far from NYC, and I was craving my Miso Salmon. Lucky me, this recipe turned out as good as the original. Something about the glaze makes the fish so tender. I think the sugar caramelizes on the surface, which locks in the moisture. And it was on the table in 20 minutes! The one 'strange' ingredient is miso, which is soy bean paste. It is sold at almost any grocery store, but definitely at Whole Foods. I bought mine in a little tub (like a cream cheese tub) for $3.99. It's salty, tangy and adds an authentic Japanese flavor to a good piece of fish. 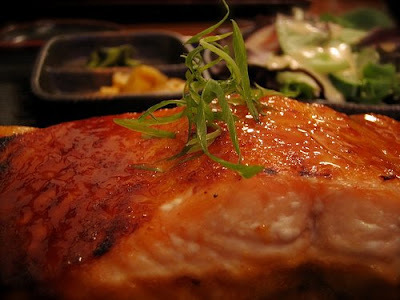 Miso Salmon 1/4 cup packed brown sugar 2 tablespoons low-sodium soy sauce 2 tablespoons hot water 2 tablespoons miso (soybean paste 4 (6-ounce) salmon fillets (about 1 inch thick, skinned and deboned) Preheat broiler. Mix sugar, soy sauce, water and miso in a bowl and whisk together. Line baking pan with foil, and leave enough foil to wrap over the top of the fish. Place salmon on foil and pour miso glaze over top. Seal foil tightly over fish, and broil in oven for 10 minutes. Open foil, and broil uncovered for 4 minutes. Fish should flake easily, but still be slightly pink-ish in the middle.